Ah, the power of social media! Not too long ago, an old chum of mine from way back (we’re talking Middle School, or as it was called back in those days, Junior High School) found me on Facebook. Next thing I know, he’s telling me he owns a carpet cleaning business and that business is slow. He didn’t even have a website. He wanted to know if I could help. Koger Creative to the rescue! 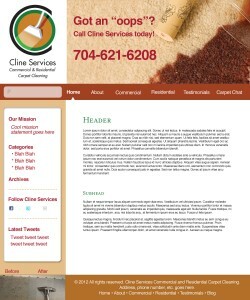 After a lengthy discussion regarding his business needs and his budget, we decided he needed a dynamic website. In other words, a website in which he could edit the content and not have to wait (or pay for) someone else to make changes to it. The obvious choice with regard to ease of use and easy customization was WordPress. Using Photoshop, I mocked up the comp (short for composite, graphic designer speak for a prototype of what the piece should look like after completion) and off to work we went. At first, I was going to try to build the site from scratch. WordPress uses themes as a starting point for websites. You do have the option of starting a theme from scratch, and this was what I was going to do. However, I took an online workshop with AWAI on the subject of building a freelancer’s website. 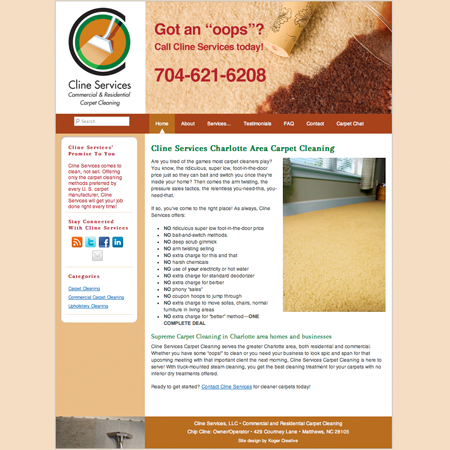 Although I took the workshop for myself, after seeing the premium theme which they recommended, I realized this theme could be modified for Chip’s carpet cleaning business website! We were doing a conference call at the time, and the theme’s developer, Tom Usborne, was there on the call. I sent him an email with a screenshot of the prototype I had created and he agreed it was indeed possible to use his theme for Chip’s site. For those of you who see this as “cheating,” please keep in mind that I did have to create a child theme and did quite a bit of customization. All you have to do is look at the sidebar and footer on Chip’s site to see how much customization I did. However, the theme provided a great starting point and saved me quite a bit of time. In short, work smarter, not harder! I am quite good with HTML 5 and CSS 3 (the mark up or architecture of a site), however PHP (the dynamic code which ties into a database) is not my strong point and I would never want anyone to think that it is. So if a developer can do the PHP behind-the-scenes stuff, more power to him (or her)! Leaves me to do what I do best, which is design. The theme was easy to edit and I would highly recommend the ProFramework theme for both designers who are building sites for their clients and for freelancers/business owners who aren’t afraid to build their own site. Chip tells me that he has linked the site to his on-going ad he has on CraigsList and that he is so busy he has had to hire part-time help! You see, Koger Creative is good for the economy! Next, we are going to promote it and the business in general with some direct mail pieces. Want to see the site in all its glory? Visit Chip Cline’s website and be sure to tell us what you think below. A couple links in this post are affiliate links. The author will profit from anything purchased through these links. Just want to be upfront and cool about that.